It’s hard to believe, but Ukulele Tricks is a few months old now. I have to say it’s been an exciting ride so far and we’re just getting started. Not only has it been a ton of fun to write up some lessons and shoot some videos, but the coolest part for me has been whenever I hear from YOU my readers about how things are going for you. I love the conversations and questions that have come up in the comments and I want to continue to encourage them. My hope for the site is that we can encourage and help each other out. All to say, in the midst of this all, I’ve realized how in my attempt to teach something I have been sharpened in my skills as a ukulele player. You might not consider yourself a teacher, which is something I’ve really struggled with too, but I wanted to look at how teaching another person ukulele can really help you and be a satisfying experience. Whenever I write a lesson here, I have to think about the components of what I’m teaching and how I’m playing it. When I consider how to play a chord, I have to think of the most efficient and best way to play a chord. If I’m teaching a strumming pattern, I have to be able to break that down in a way that makes sense. I will say this, this is not an easy task and a hard one to do well. Often times as players we pick up different habits and different stylistic components that we do very unconsciously. However, I’ve noticed that as I break these things down in hopefully the most simple way, I have a much better understanding of what I’m playing, and this does nothing but help me. I think this is the biggest reason I’ve loved doing this blog so far. When you teach someone something, they eventually want to know more. This requires you to know more and to continue to stretch yourself. I notice that my skills and understanding of the ukulele has reasonably increased as I’ve started this blog. I still have a long way to go, but I’m being challenged to learn more and to become a better player. If you have a gift or a talent, and even if it’s not to the level you want to be at, you have a responsibility to share that gift or talent with others. The question I’ve been forced to ask myself as a musician is what am I giving back to the people around me? For so long, I’ve kept my music to myself in my own time and space, but now that I’ve stepped out of that comfortable space some, I see what a joy it is to provide an opportunity for music to transform us. One of my good friends organizes a group of us to visit a local retirement community here in our city on a weekly basis. Yesterday, she had a acappella group from the university come in and sing. I went to hang out and laugh with these folks, and I couldn’t believe what a joy singing brought to the place. Admittedly, one lady did fall asleep, however! it was a strong statement to me about the power of music. I know that a lot of us struggle with a fear of performing or playing for others and might not feel ready to enter that “arena,” but even if you don’t perform, I think a good question to be asking is how can you use your music to give back to those around you? One way just might be teaching your friend how to play the uke. I’m case and point of this. What I’m learning is that you simply have to have the desire to help people in order to teach. There are a lot of better players out there than you and me, but that shouldn’t stop us. Share your gift. You have something to offer. I’d love to hear your comments about any of this. Do you have a hard time thinking of yourself as a teacher? 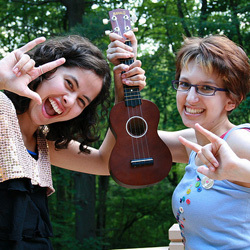 What’s been a memorable experience where you’ve taught someone something (doesn’t have to be the ukulele)? Interesting idea! I could see something like this working with a group of people where everyone is trying to encourage each other to play harder and harder songs. We definitely need to be surrounding ourselves with people better than ourselves if we want to be challenged. Hello, I have been wanting to learn how to play the uke for awhile now but I havr been wondering: Should I get a teacher or try and learn on my own? I hear it’s hard to find a uke teacher and easy to learn. Im just a bit afraid it might be too hard to learn on my own. Do you mind telling me what you reccomend?